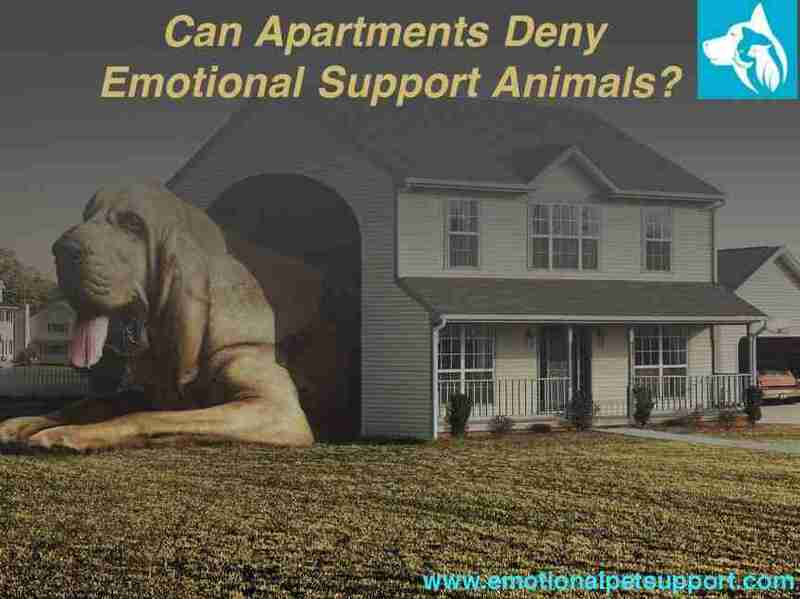 Can Apartments Deny Emotional Support Animals? When searching for rented accommodations, it’s not unusual to find that most housing providers and landlords have ‘no pets’ policy. To be fair, you can’t really blame them as pets can pose potential damage to the property and make a lot of noise, or even hurt someone, which might do more bad than good. While most renters are forced to follow the rules, Emotional Support Animals (ESA) owners may have an easier time convincing landlords let their pets stay in apartments or single-family houses. The Fair Housing Act (FHA) makes it illegal for landlords and housing communities to restrict accommodation for ESAs despite a ‘no policy’ rule. However, this law is only applicable for people who are suffering from a mental disorder. Thus, individuals who want their ESA to be granted accommodation must be diagnosed by a certified mental professional. For evidence, you must also obtain official documentation from your licensed mental health expert that you can present to your landlord. Also, HUD specifically states that the Fair Housing Act prohibits landlords and property managers from refusing to rent to anyone based on race, religion, age, gender and other factors, like the ESA’s weight or breed. Mentally disabled persons who require an ESA to cope with their mental disorder and lead a healthier life can provided a waiver in case of a ‘no pets’ provision. If a housing community or a landlord fails to comply, they could owe damaged to tenants suffering from mental health disorders. Under the FHA, apartment managers and landlords are required to make reasonable accommodations for both emotional support animals and service dogs. Will ESAs Receive the Same Treatment as Service Dogs? There are some primary differences between ESAs and service dogs hence the two will not receive the same treatment by landlords. Unlike ESAs, service dogs are professionally trained to assist their owner’s in performing specific tasks. Service dogs are trained to help improve the quality of life of a disabled person, and have been recognized by the Americans with Disabilities Act. On the other hand, ESAs are not ADA approved animals. This means that some landlords and private establishments can put certain restrictions on the animal, preventing them from gaining access to certain places, for example, the laundry room. What Else Should I Know About the Fair Housing Act? If the said ESA is too large for accommodation. This can happen if your ESA is a horse or a llama. If the building comprises of 4 or less units, with the landlord staying in one of them. If you are planning on staying in a single family house, which has been rented without the aid of a real estate agent. What Documents Will You Need to Present for your ESA? Under the FHA, housing communities and landlords possess the right to ask for proper documentation for your ESA. This documentation serves as proof that you require the services of an emotional support animal. The ESA letter can only be prescribed to you by a certified mental health professional such as a licensed therapist, psychologist or psychiatrist. For this reason, a family doctor cannot prescribe a letter. Additionally, the documented letter must be properly formatted and signed, printed using the professional’s official letterhead. The apartments and housing unit owners will want this documentation as a means of verifying that the client really does have a mental disability and needs to live with their pet. Emotional Pet Support can help you complete all of these formalities. We emphasize with all patients suffering from mental disorders and want to ease your troubles. You can begin by taking our 10-minute ESA assessment and we will walk you through all the necessary steps after that. We have a team of certified psychologists and mental health professionals that can help you throughout the entire process. You can get the latest updates by subscribing to our newsletter. Emotional Pet Support uses industry standard 256-bit encryption to secure the data you send to us including personal information accompanying your registration as well as payment information. We do not store credit numbers anywhere on our servers, they are used once only at the time the transaction occurs. We collect your e-mail address only to send you order confirmation emails. We do not sell or give any of your information, including your e-mail address, to any third party organizations. Emotional Pet Support is an organization providing emotional support animal letters written by a mental health professional.